Refrigerators, televisions and washing machines have been identified with an energy efficiency label for several years now. Since 26. September 2015, this identification has also been compulsory for heating technology. Individual components – heat generators and DHW cylinders – as well as complete heating systems are all categorised with energy efficiency labels. 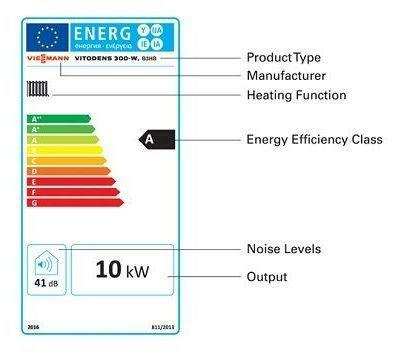 The designation of heating technology with efficiency labels is based on directives and regulations from the European Union (EU). This means that the designation is standardised throughout Europe and that the calculation is based on procedures defined by the EU Commission. This provides you with a basis for comparison and hence a decision-making aid for new purchases or modernising a heating system. Energy efficiency labels provide good guidance. Nevertheless, you should never make the decision to buy a heating system solely based on the label. Heating systems are complex; their efficiency is not only influenced by the individual product, but also by the perfect coordination of all components. Which boiler is the best for you? 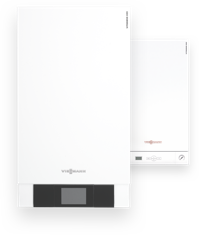 Viessmann's comprehensive range offers all heating components from a single source. All the parts are so perfectly matched that the heating system achieves highest levels of efficiency in practice. Different information can be found on the efficiency labels. The example here is for a condensing boiler. Not only do they specify the energy efficiency class, indicated with a black arrow, but also the rating or noise emissions of the appliance. The individual components of a heating system are provided with a product label. For heat generators, the best efficiency class is designated with A++ and the worst with G. For DHW cylinders, the scale extends from A to G. On combi boilers used for both central heating and DHW heating, the classification is indicated separately for the two applications. Heating systems consist of several components, all of which influence the efficiency of the overall system. For this reason, product labels have been supplemented with composite labels. They indicate the energy efficiency of the system as a whole. Consequently, for example, a Smart Home system can increase the efficiency of a heating system. If all components are perfectly matched, the composite label frequently indicates a better energy efficiency than that of the individual product labels. Only the composite label provides you with an indication of how efficient a heating system really is in.